Mother Mary Angelica of the Annunciation (nee Rita Rizzo), the Poor Clare nun who founded the Eternal Word Television Network, died on Easter Sunday at the age of 92. Mother Angelica had suffered from a debilitating stroke in 2001. Mother Angelica founded a monastery in Irondale, Alabama in 196 at a time when Catholics were only 2% of the population in the South. . As a charismatic speaker, Mother Angelica began to do radio shows in 1971 and she gravitated to hosting "Our Hermitage" for Christian cable television stations in 1978. 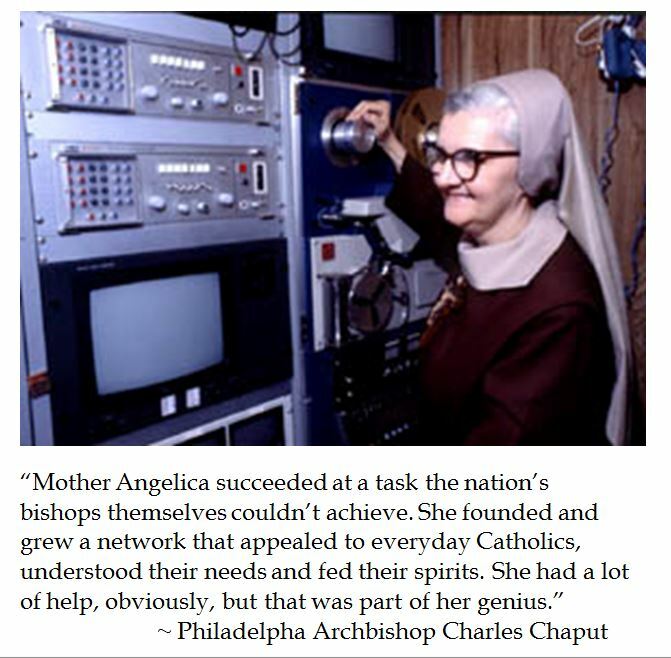 However, when the secular TV station where Mother Angelica recorded her shows planned to program "blasphemous" programs, the feisty nun protested. The station manager ignored her complaints which resulted in Mother Angelica threatening to do her show elsewhere. The station manager threatened: "You leave this station and you're off television." Mother Angelica vowed: "I'll build my own." The Eternal Word Television Network started in the Our Lady of Angels Monastery's garage in 1981 on a budget of $200. Today, EWTN is the world's largest satellite television religious network operating in Hanceville, Alabama. The EWTN media empire broadcasts Catholic programming for 11 channels 24 hours a day reaching 264 million homes in 144 countries as well as having a terrestrial radio network and shortwave service and employs 400 people. Philadelphia Archbishop Charles Chaput, who has served on the EWTN board since 1995, recognizes how this Poor Clare nun in rural Alabama was able to do what US Bishops had been unable to do, namely effectively evangelize through the mass media in this day and age. Mother Angelica expressed how she attributed all the success of her mission to emptying herself out to the Lord. Despite her failing health, Mother Angelica proclaimed that she wanted to live longer. Such a proclamation may seem surprising coming from a contemplative and convicted religious. But Mother Angelica reasoned that by doing so, she could suffer one more day for God and get to know Him better. It seems fitting that as Christians celebrate our Savior's victory over death that Mother Angelica passed into to eternal life. 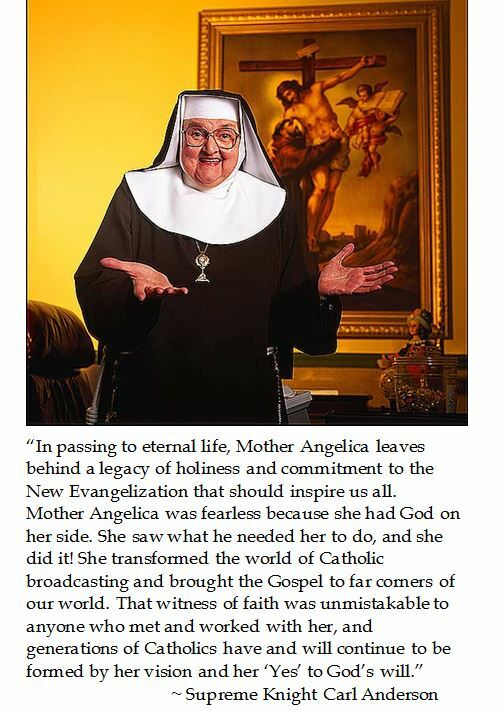 Even Pope (emeritus) Benedict XVI recognized the divine "gift" of Mother Angelica going to her eternal reward on the Church's most Holy Day. May Mother Angelica rest in peace.